On this In The Shadow of Giants Elephant Tour you’ll explore Kenya’s famous wildlife sanctuaries and discover the country’s biodiversity and cultures. This region is blessed with abundant wildlife, colorful cultures and lavishly gorgeous and photogenic landscapes – it’s a haven for wildlife lovers and nature photographers! Our emphasis is meeting and viewing elephants, and LOTS OF THEM! It is also an excellent opportunity to explore what Africa has to offer. Upon arrival at the Jomo Kenyatta Airport in Nairobi, a Capture Africa Tours representative will greet you and provide transfer to the EKA Hotel. Today we will visit the Sheldrick Wildlife Trust Nairobi Nursery for a Public, Private, and Foster visit. During our visits we meet the orphans’ and their keepers during their mid-day and late-afternoon feeding times. Hear employees from the Trust explain the project and the individual rescue stories of each elephant orphan in the nursery. You may get a chance to meet your own fostered elephant(s)! Between visits we have lunch at the Karen Blixen Coffee Garden. The day will end back at the EKA Hotel for dinner and overnight. Please note: In order to participate in the private visits you must have fostered at least one elephant within a year of the date of your visit. 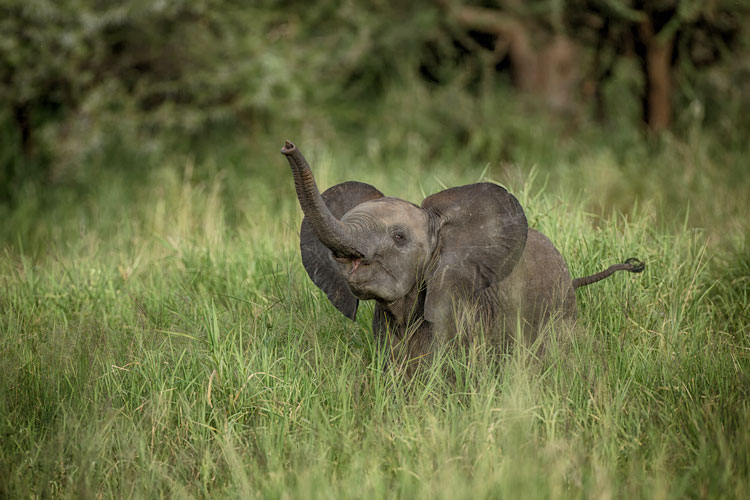 Learn more about how to support this great organization and foster an elephant through their website, Sheldrick Wildlife Trust. After breakfast, we drive to Tsavo East National Park enjoying the rural scenery en route. We arrive at the Voi Wildlife Lodge just in time for lunch. This will be our home while visiting the Voi Reintegration Unit for the next 2 days. After lunch, settle into your room for the afternoon. Relax and enjoy the view! The lodge has a watering hole that attracts elephants, lion, cheetah, and buffalo offering spectacular views and great photo opportunities. The Voi Reintegration Center is one of two facilities in Tsavo East NP where orphaned elephants, cared for by the SWT, are reintroduced back into the wild. It’s an amazing experience to see and learn about this organization’s orphaned elephant project. This is another private visit and requires you to have adopted at least one elephant within a year of the date of your visit. As time allows we will take a game drive within Tsavo East NP. Tsavo East is one of the oldest game parks in Eastern Africa. It is also home to some of the largest herds of elephants in Kenya. After breakfast we depart for Ithumba. We will stay at an intimate self-serve camp reserved for David Sheldrck Wildlife Trust donors. The camp was originally built as a conservation initiative to support the KWS (Kenya Wildlife Service). The Hill is a newer camp built into the hillside. Depending on availability, we will stay at one of these private properties. We will have the facility to ourselves and be able to enjoy the orphaned elephants that have been reintroduced back into the wild. Spectacular and breathtaking wildlife sightings await you during your stay. We have full days with the elephants here with morning and evening visits plus afternoon mud baths. Observing the older orphans and their wild elephant companions is a real treat. 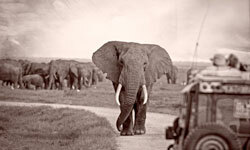 Following breakfast we drive to Amboseli National Park, best known for it’s large herds of elephants. 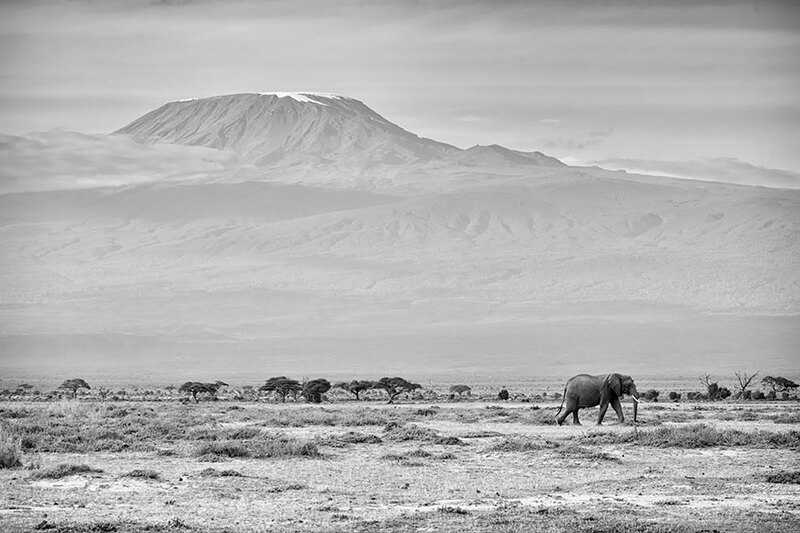 With Mount Kilimanjaro as the backdrop this park is considered one of the most scenic settings in Africa. We arrive at Ol Tukai Lodge just in time for lunch. During our 3 days here, we take morning and evening game drives through the park. A large concentration of wildlife roam this area, providing excellent game viewing and exceptional photo opportunities. We’ll encounter open plains with flat-topped Acacia trees, dried up lake beds, swamps and springs on our daily journeys. Also known as Maasailand, Amboseli NP is also home to the Maasai people. The Maasai have learned to coexist with the wildlife that surrounds them. We’ll get to experience their culture and see them living in harmony with their environment. We rise early and after breakfast drive to Umani Springs, in the Kibwezi Forest. This private, self catering property, is located on land expertly managed by The Sheldrick Wildlife Trust. This will be our home for the next 2 nights. SWT has a concession to protect and preserve this diverse 16,000-acre ground water forest, bordering the Chyulu Hills National Park. The elephant facilities here can host up to ten youngsters or more. The staff cares for them around the clock. During our stay we will visit the elephants daily. We have the opportunity to relax and enjoy this peaceful oasis. The Kibwezi Forest is a birdwatchers, botanists, entomologists, and photographers delight. Other activities nearby include seeing hippos at Mzima Springs, visiting the Kisula Caves, and taking wilderness walks around Kibwezi’s own springs and forest. Today is our final day in Nairobi to relax, go shopping, have a final visit to the Nairobi Nursery or Giraffe center before your international flight home. • Experience “In the Shadow of Giants” home to over 1000 approachable elephants in Amboseli National Park and Tsavo National Parks. • Visit the Sheldrick Wildlife Trust facilities in 4 locations for public and private visits with rescued elephants. • Maximum of 8 participants on the tour with only 3-4 people per vehicle to assure the space you need for maximum wildlife viewing. • See elephants, giraffes, zebras, cheetah, lions, and impala in their natural habitat with a majestic backdrop of Mount Kilimanjaro. This tour is designed for those who have a love for nature and wildlife. It may be especially appealing to elephant lovers. If you currently sponsor an orphaned elephant you may get the chance to meet your Elly! Besides visiting all the SWT facilities you will have an opportunity to see a variety of African animals including lions, cheetah, giraffe, zebra, cape buffalo, and rhino just to name a few. CONTACT US for additional dates and to secure your spot! TRAVEL FAQ‘s Or CONTACT US. We make every attempt to follow this itinerary. This tour may not be identical to what you have signed up for but can be altered/changed in any way depending on your needs. However, certain conditions (political, climatic, cultural, environmental, or wildlife migration) may require changes. We reserve the right to alter any itinerary at any time, if necessary. We will notify participants of changes as far in advance as possible. Costs incurred by such changes will be the responsibility of the participants. If this tour is for you, please contact us at the link above with your contact information and any questions or special request you have.